Every week at Community Northern Beaches we have women, rich and poor, phoning or walking into our centre and asking to see Anona (Nonnie) Le Page, our Domestic Violence Officer, to get help because they are being abused by a man with whom they are living. This abuse is often physical, always psychological and sometimes financial. Very often there are children embroiled in the trauma of these situations. Nonnie works with these women to assist them in moving on and rebuilding their lives. We believe strongly that there is a huge need to highlight this ongoing social crisis in order to try to protect those victims and survivors who are involved. 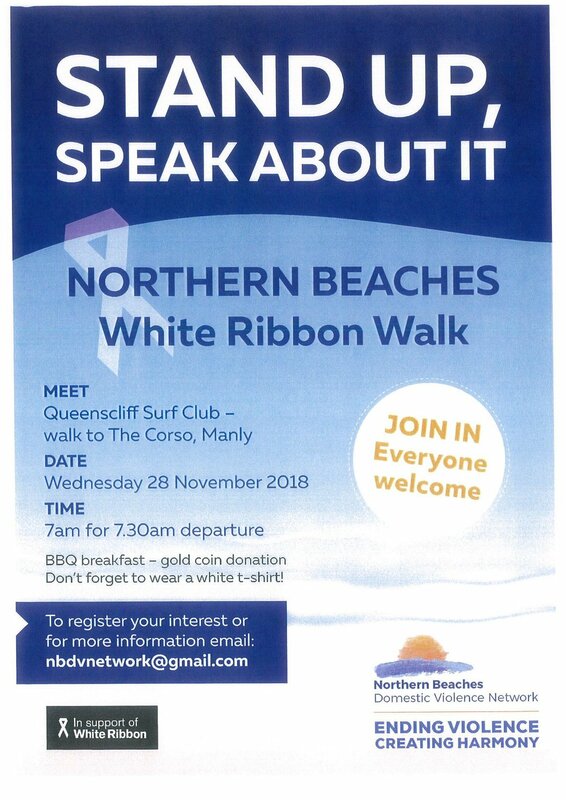 Consequently we are participating in organising the White Ribbon Walk in November. BBQ breakfast - gold coin donation. Don’t forget to wear a white t-shirt!